Normal depth is an important parameter for the design of channels and canals. 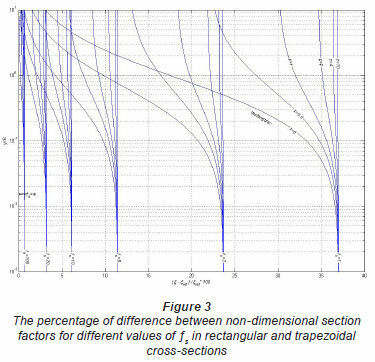 For rectangular, trapezoidal, and circular channel sections it is possible to express normal depth by a trial-and-error procedure or analytically. However, the effects of free-surface on the design charts for determination of the normal depth are not investigated. 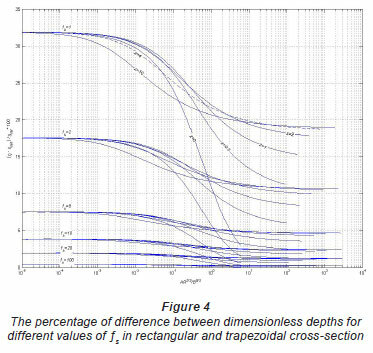 In this paper, graphical solutions of normal depth for the rectangular, trapezoidal, and circular cross-sections have been obtained in the non-dimensional form. To evaluate the resistance effects of the free-surface in the calculation of the normal depth, the dimensionless-form of Manning';s equation with free-surface weight factor is introduced herein. The design charts reported previously were modified. Unfortunately Eq. (1) is implicit in the normal depth for the majority of cross-sections. To determine the normal depth, one has to apply time-consuming trial-and-error methods. Graphs and tables have been provided for some of the simpler cross-sections (e.g., rectangular, trapezoidal, triangular, and circular sections) by Chow (1958), Henderson (1966), and French (1986), among others. Swamee (1994) presented explicit equations for normal depth in rectangular, trapezoidal, triangular, and circular sections. Shirley and Lopes (1991) have reported an iterative procedure for quickly and accurately solving the implicit problem of determining the normal flow depth in complex channel sections. Babaeyan-Koopaei (2001) reported graphical solutions for normal depth in round-bottomed triangular, parabolic, and round-corner rectangular cross sections. From the above literature search, it appears that a free-surface effect on the normal depth has not received any treatment yet. This research aims to present graphical solutions for the effects of free-surface on the design charts for determination of the normal depth. Generally, this parameter must be determined by experiment. If fs = 1, the free-surface is equivalent to the wall. If s tends to ∞, there is no wall in the position of the free surface, and the third term in the denominator of Eq. (2) becomes zero and Rh tends to conventional hydraulic radius. A family of dimensionless curves for circular cross-sections showing the relation between η and 2(η, s) is shown in Fig.1 for s = 1, 2, 3, 4, 5, 10, 20, 100 and ∞. Using Eq. (3) and Fig. 1, one can find yn /D and, hence, normal depth yn. For high accuracy Fig. 1 is divided into 4 parts (Figs. 1b-e). z is the side slope (zH:1V. A family of dimensionless curves shown in Fig. 2 for a trapezoidal cross-section with z = 0.5, 1, 2, 4 and 10 using the relation between η and 3( η, z, s) for s = 1, 2, 3, 4, 5, 10, 20, 100 and ∞. Using Eq. (4) and Fig. 2, one can find yn/B and, hence, normal depth yn. For high accuracy Fig. 2 is divided into 2 parts (Figs. 2b, c). Example 1: Given a trapezoidal channel with a bottom width of 5 m, side slopes of 1:1, a longitudinal slope of 0.00035, and a resistance coefficient of n = 0.015, find the normal depth of flow for a discharge of 20 m3/s. By using Fig. 2, with z = 1, and s = ∞ (free-surface not affecting the normal depth) the dimensionless depth (y/B) is 0.3898, thus the normal depth (yn) is 1.949 m.
Solutions of this example with effects of free-surface on the normal depth for various s is given in Table 1. Figure 1(a) and Figure 2(a) have low accuracy but Figs. 1(b-e) and Figs. 2(b-c) have high accuracy. With the aid of a computer program, one can determine the normal depth using Eqs. (2), (3) and (4) for rectangular, circular and trapezoidal cross-sections, respectively, for effect of free surface on the normal depth. Using Eqs. 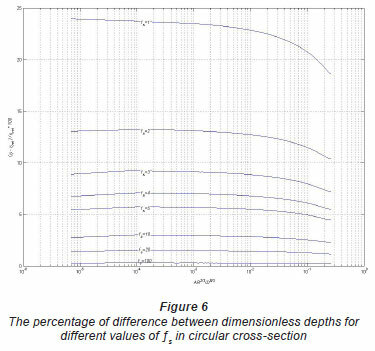 (6) and (7), the dimensionless depth vs. non-dimensional section factor for different values of s is shown in Fig. 3 in rectangular and trapezoidal cross-sections. In Fig. 3, the effects of free-surface take lower values for larger y/B, for all values of s. If s = 1, the free-surface is equivalent to the wall (flow in duct). If s tends to ∞, the effects of free-surface take lower values. In Fig. 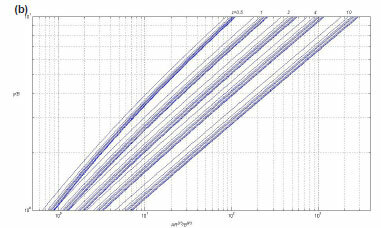 3, it can be seen that the effects of free-surface do not provide a meaningful change for y/B < 0.01 in constant s. In Fig. 4, the relative errors are indicated and the relative errors that were computed in Example 1 can be seen within this figure. In this figure, if s is constant, it can be seen that the effects of free-surface on the normal depth take higher values for great values of side slopes. In these figures, the side slope is z = 0, 0.5, 1, 2, 4 and 10 for all values of free-surface weight factor. 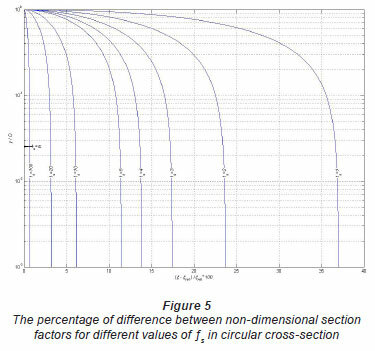 The same analysis described for the rectangular and trapezoidal cross-sections was also performed for the circular cross-section obtaining similar results, but with diameter of circle (D) instead of B. The behaviour of the curves shown in Fig. 5 and Fig. 6 is similar to that described in Figs. 3 and 4. Figure 5 shows that for all s in y/D = 1 free surface does not affect the normal depth. 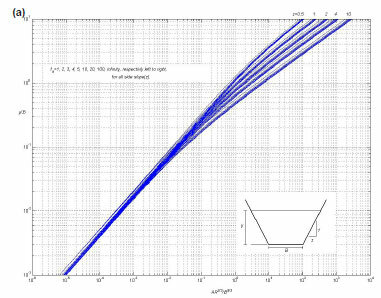 The effects of free-surface on the design charts for determination of the normal depth are presented. A graphical solution of normal depth is proposed here that was used to calculate a design chart with the effect of free-surface for open channel flow. 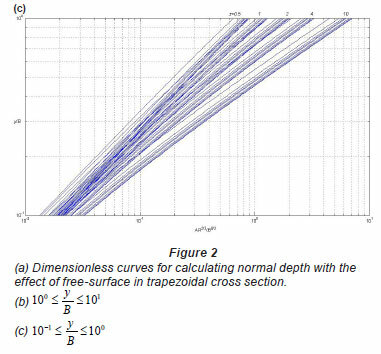 Figures 1 and 2 can be used to calculate normal depth in rectangular, circular, and trapezoidal cross-sections with the effect of free surface. Received 19 April 2011; accepted in revised form 14 December 2011.